Dawn Nelson is the author of several western-themed novels, and has also dabbled in non-fiction. 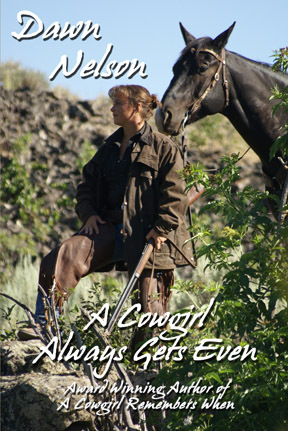 In A Cowgirl Always Gets Even, she shares some of her misadventures on the ranch, as well as her musings on people and circumstances. Ranchers will find some of these anecdotes humorous, as she relates tales of ornery bulls and cows. Weather and icy temperatures also play a part in some of these stories. When sharing her thoughts on people, Nelson’s tone is often sarcastic, and she appears to view all non-ranchers in a deprecating light. There are numerous misspelled words and grammatical errors in this book, and it should have been more carefully edited before being published. If you’re a rancher, you’ll probably relate to some of the incidents Nelson shares. And if you’re not, you may want to take a lesson from them.